What is your little one going to be for Halloween this year?? A ghost, a gorilla…maybe even Gaga (…Lady Gaga that is)??? Well whatever he or she chooses to be this year, one thing we want them ALL to be is SAFE! With that in mind we’ve gathered up the best Halloween tips and tricks that we could find from the most reliable safety sources we know. Full credit…and our thanks go out to them. If a sword, cane, or stick is a part of your child’s costume, make sure it is not sharp or too long. Do not use decorative contact lenses without an eye examination and a prescription from an eye care professional. They can cause pain, inflammation, and serious eye disorders and infections, which may lead to permanent vision loss. Remain on well-lit streets and always use the sidewalk. Never cut across yards or use alleys. Remind kids to brush before (and after) eating candy: Tooth decay and cavities occur when sugar reacts to bacteria and dental plaque. Brushing before candy consumption reduces the amount of bacteria and plaque on the teeth. Watch out for hard candy: Don’t just monitor the amount of sugar a child consumes, but also how long they keep sweet treats in their mouths. Kids should eat the candy right away, limit chewy candies that stick to teeth, as well as hard candies, which will be slowly eaten. Monitor overall candy consumption: There are two recommended options. Keep candy consumption limited to a few pieces a day given with a meal or a snack. Alternatively, have the child eat whatever the amount the adult decides at one setting, and then have them brush their teeth afterwards and give or donate the remaining candy. Let the kids dress up and run house to house, while you carry a safe snack in case they want one. Bring wipes to clean the little hands first! 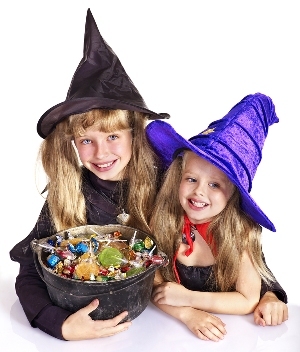 If permissible, donate leftover candy to children who may not be able to go out and trick or treat. Make sure wireless phones are fully charged. Pre-program contact information of parents, neighbors and emergency services into your and your child’s speed dial, and be sure they know how to access these numbers with ease. Establish boundaries – Families should have in place a familiarized route for children to follow while out on the town. Consider a small tracking device that can easily slip into your child’s candy bag like the Garmin GTU 10 and follow them via PC or mobile phone. Set up periodic alarms with Halloween-themed tones as a reminder for trick-or-treaters to text or call home between candy collecting stops. Wishing you and your family a safe, happy and healthy Halloween!! I’m lucky to have a great neighborhood to have my kids trick or treat in but terribly unlucky that I’m scheduled to work so my ex gets to have all the fun! I missed trick or treating with my little ones. I had a class last night, but I know they had fun. Their mom’s neighborhood is great though and everyone watches out for everyone.